We seem to be on the cusp of a 3d TV revolution. There are real 3d TV’s in real shops to buy. They are expensive (ish) but the massive growth in flat screen digital televisions, the introduction of high definition and the HDMI cables and sockets to drive them has had a knock on effect to create the base for 3d TV’s to enter the market. The speed this has happened is stunning. It was only a few years ago that we got our first large LCD TV. It was by no means a common sight in stores, the cathode ray tubes bulked up most of the space in the tech shops. We may have adopted a little early as ours only goes to 1080i or 720p not full HD at 1080p as its called. 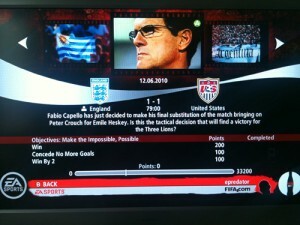 However its been a great TV and having HD content to drive it, in particular from the games consoles has been superb. Now though its getting a bit washed out. It needs a replacement. I went to experience some 3d TV’s to see if it was worth it yet and found myself in that awkward upgrade path dilemma. The two I looked at were very different and felt very different. A passive cheap glasses version and an active “glasses need batteries” one. Like all these things I am sure you get used to them eventually but I could see the frames flicking in the active one, not in a really obvious way but I could feel the tech working. The passive glasses over the top of regular glasses give the same feeling as when you put your specs on in the morning and you eyes and brain struggle for grip. So, yes the pictures were in 3D, though they seemed to be more cut out layers (in the football anyway) than the depth of the cinema experiences like Avatar. The thing I did not get to try though was 3d gaming. I am wondering if the fact that TV watching is a passive activity that we sit back and wait for the entertainment means we notice more the effect of the glasses. After all we have been watch TV all out lives and are pre disposed to know how it feels. Gaming on the other hand brings an expectation of getting in there and doing things. I suspect that may be more of a draw to a 3d TV. 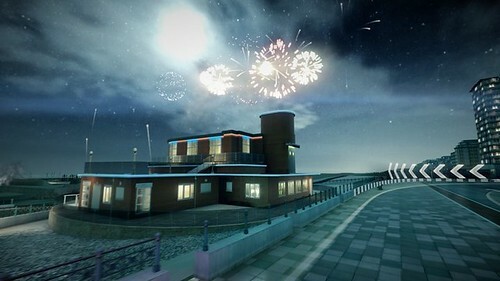 Game content, and virtual world content of course lends itself to being rendered in full 3d. 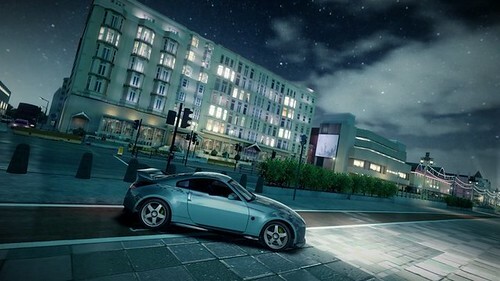 The model of the world in many games is already fully 3d. We known that the door over there is 5 metres away and the tree swaying the in breeze is off to the right and 30 metres away. Objects are places in virtual environments, hence they are already instrumented to allow a virtual camera to render them in 3d. That feels like it will make for much more obvious and less planar 3d experiences. Soccer and TV on the other hand has to deal with a finite number of cameras to sense and understand the depth of an image. Whilst every pixel in a scene of a game may be addressable with an xyz component we don’t yet have cameras that understand every photon arriving at them and its relative position in the world. So I am left wondering if there is a combination that works well here. Does a passive experience only need a passive 3d system, an active game experience an active 3d system. Probably neither. With systems starting to sense where we are in the world I think the use of 3d glasses will fall away rapidly. Specs are a barrier to entry for a mass use device like TV. They are not such a barrier to gamers though. Kinect will known who is where in a room, not full precise eye tracking but its a massive leap forward, all it needs is the devices showing the pictures to know where to send them. I.e. be truly active and like the eyes of a painting follow you around the room your visual and audio experience is tuned to you. It is not so far fetched as you can see here a system that tracks 2 people in a room and projects the correct left and right images to them. The nintendo 3DS which is a single user game console has very smartly added no glasses lenticular 3D. Though it has raised another concern over 3d visuals (I am starting to sound a tad luddite) and children under 7’s eyes. Given what I felt wearing the early specs it does feel as if there is a pull on the eyes. Yet as in the article above a totally glasses free system such as the 3ds seems to have less effect and have less impact. So I really don’t know. I feel that being a gamer is really the driving factor here. More interesting and immersive experiences. Being a metaverse evangelist working worlds that already have 3d and that can also be made more natural for people to enter and understand also makes sense. As an early adopter I don’t want to be too early though and miss out as we did with Full HD. As a parent I certainly don’t want to cause any harm to the predlets. So TV industry and games industry. What is going to convince me to make this buying decision ?
. That is now rectified, and in no small part thanks to Jay “Springwatch” Dykes (also Wimbledon behind the scenes) for having reminded me and giving it the thumbs up. Blur is a very arcade style racing game, as a driving experience, with kart style weapons and power-ups it is very different to PGR4. So it is good, though in gaming terms not overly innovative, but very well executed. What is different though is the integration they have put in on all the platforms with places outside of the game console. You are able to link both twitter and facebook accounts to share various elements of the game, whilst still in it. A few others have done things with microsites for the game to be able to upload and share photos etc. This though is a little further down the line in injecting itself into existing social networking platforms. Share that to facebook, and in this case take that and put it on flickr myself. Each of the social media messaging systems add a predefined piece of information onto them. This is both clever and potentially annoying in the same measure. Though does break out of the the xbox or ps3 only style communications we have. Not quite cross platform integration but close. Rockstar’s Social Club for GTA and RDR is probably the most advanced in linking the platforms together and providing more than a micro site. If I tweet a message I can edit my part of it but will be forced to have something appended to it such as “I’m playing #blurthegame”. That is a little too game specific I think. yes its great to have a helping hand with hashtags and proforma tweets for certain achievements, but it gets spammy very quickly. Other interesting features, once that is also in the xbox arcade titles now, is that of creating a challenge for a friend. Something that Bizzare have kept is modelling real world locations. In this case both above and below there are pictures from Brighton. This is where many people from the games industry (including me) will be next month at the Develop conference at the very hotel in the top photo if I am not mistaken ! So it looks like the game industry is not going to ignore social media (they have all just been a little slow) maybe next the tentacles will extend out into virtual worlds and richer web and mobile experiences. I have a keen interest in how we get to represent sporting events in ways other than just TV coverage. This years world cup is already showing a little of what can be done once the rights have been agreed. Rights management, just as in the music industry is a huge business. Of all things it is the thing stifling the explosion in creativity that could be had with all the data and feeds of information from live sports. Something I was hoping would be a bit more open for the 2012 olympics but it looks not to be the case. Though there is time and hope. EASports are one of the biggest sport game producers with lots of franchise lock-ins including football(soccer). So it was natural that this years world cup got the usual treatment of a branded game. I am not a massive football fan but these large tournaments and getting behind the countries team does reach me and I also usually end up with a game of the tournament. Given they are every 4 years the world cup ones help set a timing on what a platform of console is up to at that point in time. France 98 for instance was the same as my first year working at Wimbledon. It was the out of hours game of choice, played in the UK house we rented and played on my Nintendo 64 that I took up for the fortnight. This year my world cup game is on the Xbox360 and hooked up to the net. There are all sorts of interesting features but the one I wanted to see how it felt and worked is operational now during the actual tournament. The option is hidden away in the “Story of Qualifying” section. Here there are recreating crunch moments and scenarios that have happened in the actual tournament (and in the lead up). It becomes a playable news feed. You pick a scenario and then dive in and try and beat the odds or change history. This is a nice feature and there are a few scenarios in there but I really wish it went further. The scenario is just a set initial start conditions and some special win conditions e.g. score 2 more goals. However with an engine as powerful as the game has it would be fantastic to be able to watch the entire match, or its highlights in the replay editor. There is of course a small problem of getting the accuracy not only of where the player was but where there arms and legs are for fidelity of replay, however it has been done before to some extent. Looking at the sort of thing NASCAR does with raceview much of the sports coverage is quite behind the times. If you take Formula1 the pinnacle of motorsports, we have a timing feed application on web and mobile to watch and a text based commentary, or the TV. We have a visually rich console/PC game from Codemasters, but that is not out until towards the end of the season in September. I hope that in a few years time all this gets in synch and by next world cup we will be able to enjoy it in a host of other interesting ways. ***Update I just bumped into this article on engadget about EPSN just getting on and doing innovative things with sports coverage. Good design of any sort is really effortless, or joyous for those on the receiving end of it. Something that has had a whole load of great design go into it is the new gaming classic Red Dead Revolver. Non gamers and “serious” types may just consider this as trivial as hula-hoop. A toy that a few grown ups enjoy playing with. Well…. it is. At one level of abstraction it is a football, a hoop and stick. On another level, it, and the current generation of well crafted gaming experiences are a fantastic example of good design and talent. 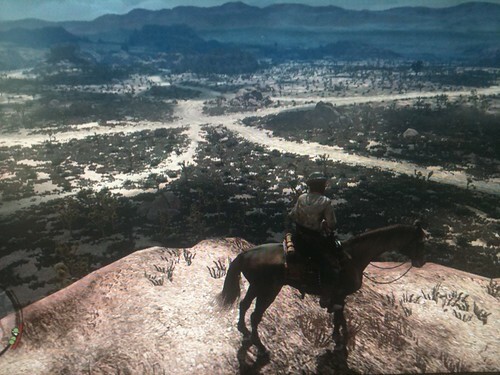 Red Dead Redemption is a cowboy gaming experience. It is an exceptionally large free roaming area interspersed with a plot that takes you from set piece to set piece. You can if you want just go for a ride and see what happens though. The first thing that most people latch onto, with good reason, is the graphics and the animation in the game. Given where we were only a few years ago the graphics quality, the detail on things like the horse animations, the size and scale of the terrain, the flora and fauna and even tumbleweeds is very good. Still pictures do not do it justice. Xbox 360 or PS3 though it just works. Just think for a moment the amount of graphic design time that has to go into both the size and scale and the intricate detail. The flowers on the plants, the mane on the horse. Even the bullets in your bandolier are all created by someone. So as a graphic design task, even with tool and middleware support this is a monumental undertaking. Of course tiling, and cut and paste comes into play, but just consider the person hours of skilled design tool usage then add to that the overlaying of the design of “where” all these things go and can go. Under the covers there is of course code. Programming and detail in allowing things to happen, chaining effects together, determining where and when a bullet has hit. As a programmer I know that most people do not see the code under any of this, but it takes as much design effort and talent as the visuals. The system architecture and middleware combinations becoming the “where” all these things go. The things that people don’t have to get involved with and that have really evolved so much and been taken seriously in the production values of high end games are things around the sounds and voices that you hear. The sound design is generally so well done, creates so much atmosphere and is in some senses more transient than the visuals that it almost melts away. Also the acting quality is just miles beyond the early fumbling attempts to read badly written dialogue we used to see and hear. 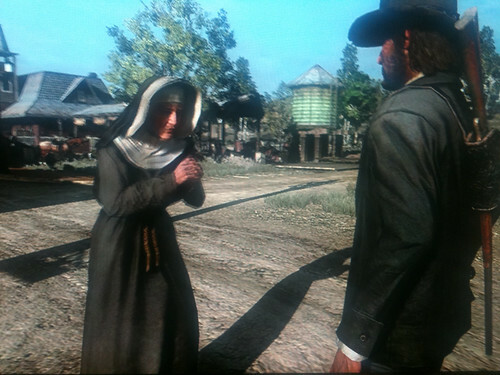 When the characters in the game talk to one another in cut scenes or as part of atmospherics in a town it feels real. Of course the dialogue has to be layered with western style occasionally over the top elements, but films that we passively sit and watch have all sorts of over the top characters. Threading all this together is the script, both a story arc and then the micro stories that form at key points in the game progression. Thrown in are also random events that happen around the place as you travel around, thefts and challenges which you choose to engage with. Its all highly immersive, and very entertaining. That is without even engaging in what is in effect a completely different use for all these assets, the multiplayer games. These take place in the whole environment, fellow real people being cowboys and travelling the land living their own stories. Now clearly I am a gamer, but I do not always feel compelled to complete a storyline. However recent months have seen Modern Warfare 2, Uncharted 2, Heavy Rain and Red Dead Redemption all making me want to complete the storyline and not ending up disappointed. There are lots of games but these stick in my mind for being good stories and for me wanting to, and actually bothering to complete them. Many people will of course not spend 40+ hours on a single gaming experience of this sort, though they will of course spend 40+ hours grinding on Farmville, or breaking jewels in Bejeweled and alike, or maybe watching Eastenders or Coronation Street repeat soap plots. It is though all good as far as I can see. Games and gaming experiences, both ones we create for ourselves and ones we are directed through are as memorable as any traditional film or TV experience. The effort and design going into them warrants the time and attention to explore them. For me it is of course business and pleasure, research and a release, which makes it doubly valuable. One of the greatest things about the web is that whilst there may be the ability for anyone to share anything that is truly rubbish, there is also the ability to share things that for a niche audience they will appreciate and love. One such thing is this very clever, but very geek related parody of the Katy Perry/Snoop California song. You will see if you click through ti YouTube Skyway Flyer has put the transcript of the lyrics too, in case anyone who is not so geeky has to look up Flux Capacitor. I bumped into this one though on Buzzfeed. Yes another service to help us thread and aggregate interesting things. It was here Buzzfeed (thanks to Rita King and Jerry Paffendorf for pointing me at it) lets you rate and badge content from elsewhere and then spread the word. It is sort of categorized into LOL and GEEKY etc. For these geek parodies though I suspect they will fill up the feed very quickly 🙂 If they are as good as this one and the previous New Dork one then I am happy. Nerdcore as a music form seems to be ever on the increase, creative people who are also tech geeks taking a tongue in cheek look at life and sharing it over the very medium they are spoofing. 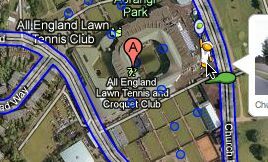 Yes it thats time of year again, the Wimbledon Tennis Championships is about to kick off and as I have written before (was it really a year since I wrote this!) for me and anyone who has had the pleasure and stress of working the event its a special time. I think the allegiance to it as an institution and to the team of people never goes away. In our life equivalent of gamer achievements we probably have some very unusual badges to share. All this means I am still interested in how people attach themselves to a significant event, there are a lot people jokying for digital rights and “official” sponsorship. However some of it is just publicly owned association to the event, i.e. support. I was looking at google street view the other day and noticed a change I had not seen before. 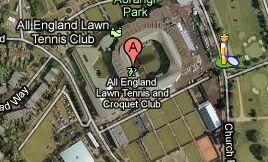 The little drag and drop man around Wimbledon has changed to a tennis player. Even more cute/clever when you drag him around he changes into a tennis server gesture. Anyway good luck to all my friends at Wimbledon from the old firm and associated groups. You do a cracking job. It was fitting that the last day of the holiday wandering around Disney Downtown we ended up in the Lego Innovations store. 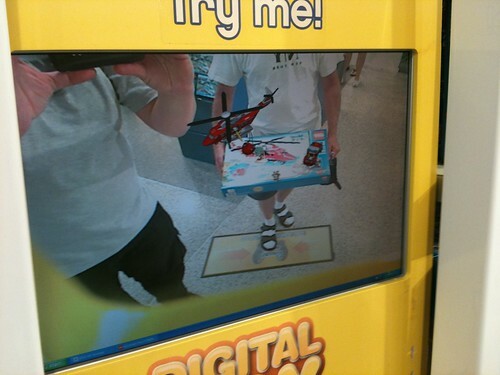 For some reason I nearly missed seeing the Augmented Reality kiosk that lets you see whats inside your lego box. I have seen this in videos before, but it was good to have a go with what is an ar Magic Mirror in a commercial environment. Certain lego boxes are available near the kiosk and you just hold it up and away it goes. It animates the contents of the box. There were a few peoples who did not notice it either, once I started using it a queue formed 🙂 Dad’s were busy video it and kids were busy going wow look at that. 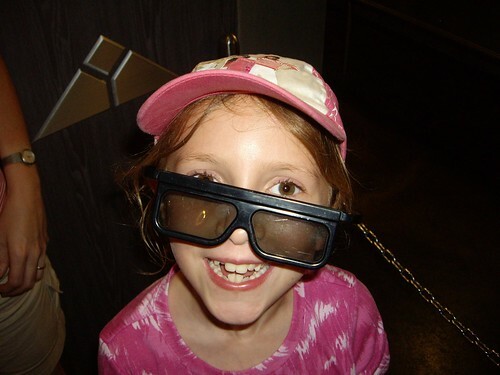 Maybe these bodes well for the next gen tech they will start using in the theme parks as we saw lots of 3d (with glasses) of course and a location based service using a mobile for a treasure hunt. An energy sweeping game. 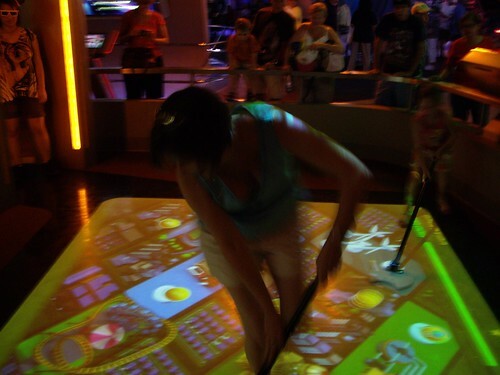 It used what looked like a metal detector or round shuffle board stick to move virtual energy “pucks” that had to be croupier pushed to various stations. It was by Siemens, and was OK but a bit laggy.